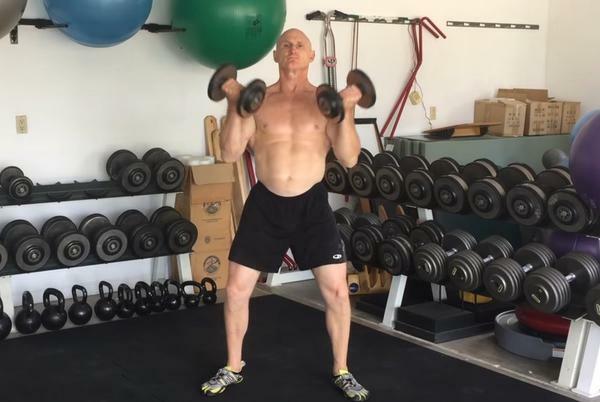 Do you need an exercise you can perform when you’re in a hurry that still allows you to get a full body workout safely and effectively? One of my favorites is the Squat Curl Press, combining the squat, biceps curl and overhead press into a single exercise that I describe in my video. Couple that with another movement directed at your core or some kind of pushing exercise, and you’ll have a complete workout in just four cycles of two exercises. Make sure you warmup properly. Be sure to time your breathing to the movement. Be aware of any pain and don’t do it if you’re not feeling it or just aren’t ready for this kind of workout. If it’s hard for you to squat all the way down due to knee problems, just start in the range of motion you can do safely and without pain. Use weights that allow you perform anywhere from 26-30 reps. That’s another way to ensure it’s safe to keep breathing! I’ll show you how to use the squat curl press exercise as a work-in/breathing and pumping exercise too. If you’re curious about learning more about my approach to functional exercises, I encourage you to check out my Gym Instructor video series and my book, Movement That Matters.